He was Managing Director and CEO of the EXIM Bank Limited and Islami Bank Bangladesh Limited. Mr. Md. Fariduddin Ahmed started his banking career in Sonali Bank as Probationary Officer in 1977. 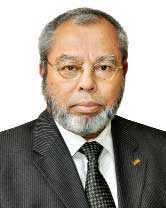 He joined Islami Bank Bangladesh Limited on the date of its establishment on August 30, 1983 as Manager and held the position of Managing Director and CEO before retirement from that bank. Mr. Ahmed visited many countries including USA, UK, KSA, China, Hong Kong, Thailand, Macau, Iran, UAE, Qatar, Bahrain, Pakistan, Singapore, Indonesia, India, Nigeria, Switzerland, France, Germany, Japan.